Unique Moments photography of Gig Harbor Washington captured this fall bridal portrait 5 yrs ago and we show it at every bridal show we participate in. June, September and October are the top months for brides to select venues for wedding ceremonies. 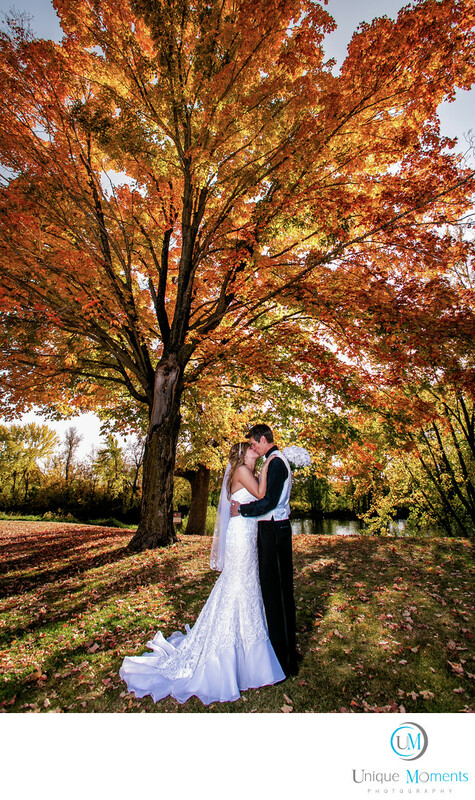 Fall colors are primary reason Numero Uno as to why brides want to get married in October. Who can blame them. When you select Unique Moments Photography to cover your wedding we always scout local areas to the venues to find great fall colors. This images was at a local park about 3 miles from their venue. The colors were amazing. Her venue had zero color opportunities for fall pictures. We want amazing fall colors for your fall weddings so be prepared to add some time to the timelines because we are going to find great color to use it for your outdoor bridal pictures.